The Head of Tax at Johnston Carmichael on tax planning strategies and why tax professionals should go to meet clients in person. 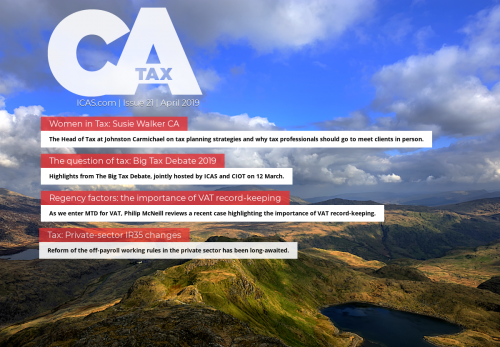 Highlights from The Big Tax Debate, jointly hosted by ICAS and CIOT on 12 March. As we enter MTD for VAT, Philip McNeill reviews a recent case highlighting the importance of VAT record-keeping. Reform of the off-payroll working rules in the private sector has been long-awaited. Back to basics on self-employment, updates to PCRT, the key dates for your diary in upcoming months and more.